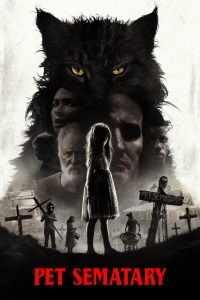 I enjoyed the big change to the ending while I was watching the movie, I think just because it was finally something different (and the kid actress was astounding going from good to evil, which helped). Later I was thinking about how dead people dragging other dead people to the sour burial ground kind of undermines the theme of grief driving Louis to do irrational things that keeps ratcheting up in the original book/movie as I recall. The dead child killing the parents with the intention of bringing them all back as a family of evil undeads is...interesting, I just feel like it's only there to be kind of twisted and scary, I'm not sure what it's supposed to mean. I really think this movie would have made more sense if the cat, Church, belonged to another family. Then Louis could plausibly only know that the cat was brought back to life and not that that its reincarnated personality was manifestly evil. Instead, we spend half the movie watching Louis reach the point of wanting to (re)kill Church to keep him from harming family members and settling for an unsuccessful effort to get him out of their lives by dropping him off in a remote area. On top of that, Louis has been repeatedly haunted by the dead student but fails to put two and two together; if the cat belonged to someone else we would understand that as PTSD. So Louis--who is presented to us as a rational man--has plenty of advanced knowledge about exactly what his newly undead daughter will be like, plus all the warnings from Judd, and brings her back to life anyway.